Papa John’s International Inc.’s (PZZA.O) Chairman John Schnatter resigned after coming under fire for making racist comments that battered the shares of the pizza chain he founded. The independent directors of the company accepted Schnatter’s resignation, the Louisville, Kentucky, company said in a statement late Wednesday. 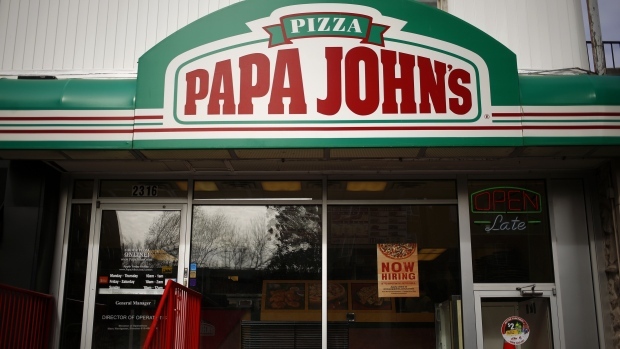 Papa John’s will appoint a new chairman in the coming weeks, the company said. Just seven months after exiting the CEO role over critical comments about the National Football League’s national-anthem dispute, Schnatter came under pressure following a media report that he used a racial slur and graphic descriptions of violence against minorities on a May conference call with a media agency. Schnatter admitted to using an offensive racial term during the call and apologized, according to a separate statement earlier Wednesday. Papa John’s shares slumped 4.8 per cent in New York on Wednesday, closing at the lowest level since February 2016. The stock has dropped almost 30 per cent since Schnatter’s remarks about the NFL in November. Schnatter apologized last year for remarks he made when he criticized the NFL for its handling of players’ national-anthem protests, saying the comments hurt the pizza chain’s sales. The departure of Schnatter follows an inappropriate language case in June at Netflix Inc. The video-streaming giant fired its chief communications officer for using a racial slur more than once in a work setting. The executive, Jonathan Friedland, first used the N-word in discussing appropriate speech, and again later with human-resources executives. Forbes reported that the latest incident involving Papa John’s chairman took place on a May call arranged between company executives and Laundry Service, a media agency, as a role-playing exercise for Schnatter to prevent future public-relations missteps. Laundry Service decided to cut ties after Schnatter’s behaviour on the call, according to Forbes. Laundry Service didn’t respond to requests for comment. Laundry Service, owned by sports agency owner Casey Wasserman, told staff in a May 31 letter that it would be ending its work with an unnamed client due to “the regrettable recent events that several employees of Laundry Service witnessed during interactions with a client’s executive,” according to a copy of the letter obtained by Bloomberg News. The agency didn’t name either the client or the executive in the letter. Papa John’s CEO Steve Ritchie sent an internal memo to team members, franchisees and operators on Wednesday addressing the event, though without mentioning Schnatter by name. “You may have read the media reports today tied to our company culture. We want to make it clear to all of you that racism has no place at Papa John’s,” according to the memo obtained by Bloomberg News.